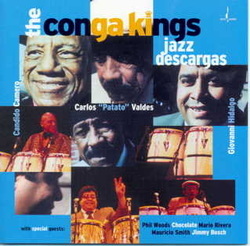 The Conga Kings, featuring Candido Camero, Jerry Gonzalez & Giovanni Hildalgo, will be touring in tribute to the late great conga masters Carlos “Patato” Valdez and Francisco Aguabella. The Conga Kings are a 9-piece Rumba group featuring 3 master congueros: Candido Camero, Jerry Gonzalez & Giovanni Hildalgo. Their concerts are a spontaneous celebration of modern rhythm and melody, a joyous colloquium of Jazz and Afro-Cuban sounds by the likes of Machito, Dizzy Gillespie and Tito Puente. Historically, musically and conceptually, this rhythmic dream team is creating the genuine article. NEA jazz master Candido Camero, the Havana-born 87-year old elder statesman of congas, is a living encyclopedia of the history of Cuban music. Candido has worked with all the Jazz Masters including Duke Ellington, Charlie Parker, Mongo Santamaria, Dizzie Gillespie, and Tito Puente, and has over fifty recordings as a leader. 60-year old Jerry Gonzalez is the leader of the highly influential Latin Jazz Group Jerry Gonzalez And the Fort Apache Band and has been a pioneer in Afro-Caribbean music, jazz, and flamenco for over four decades. As a conguero he aptly demonstrates how a percussionist can bring a melodic understanding of music to the art of conga playing. Recognized as the current master of the congas, Giovanni Hidalgo melds Afro-Caribbean, jazz, and folkloric influences with unmatched showmanship and his signature nimble handed style. Having worked with great artists such Eddie Palmieri, Mickey Hart, Paquito d’Rivera and Freddy Hubbard, Giovanni has the remarkable ability to project his imagination and musical wisdom into the Conga Kings. The distinct conga playing of The Conga Kings is beautifully complimented by the breathtaking solos and familiar melodies performed by David Oquendo (tres), Enrique Fernandez (saxophone & flute), and the vocal arrangements of Ray Santos. "The Conga Kings bears repeated listening just to comprehend the nuanced interplay of this unrivaled percussive triumvirate." Jerry Gonzalez – Congas, trumpet.